Lance Richardson views the harbour from a different perspective when he climbs aboard for a friendly twilight race. As Sydney workers flee their offices on Friday evenings to beat the traffic - a race, ironically, that creates the traffic - another race takes place that mocks the bottlenecked cars and uninspiring commutes of the highway. In the middle of the harbour, near Clark Island, dozens of yachts are circling each other like dancing kites, waiting for the signal to dash to Lady Bay and back in friendly competition. For this weekly race, hosted by the Royal Australian Naval Sailing Association, those without the luxury of their own yacht can join the crew of Pilgrim, a custom-built Kaufman 58 that's moored off Double Bay. At 18 metres long, with teak decking and an enormous mast, the boat is a striking sight as it unfurls its sails at the direction of skipper Paul Ley and his wife, Clare. ''See this stuff over here called land?'' Paul asks, beginning the safety briefing after everyone is aboard and safely established with a beer. ''We need to avoid that.'' And then, more helpfully: ''It's called the boom because that's the sound it makes when it hits you in the head.'' As somebody who seems to have absorbed a great deal of sun and salt in his time at sea, our captain is authoritative in a ''wink wink'' sort of way, maintaining a ship morale than can only be described as permanent happy hour. This is reinforced moments after the signal erupts for the race to begin. ''A really important job is holding drinks,'' Clare tells me, passing glasses as her husband scoffs at a neighbouring yacht that appears to be taking things a little too seriously. Winning a twilight race is grand, apparently, but even better if it appears effortless. After an initial moment of tense jostling as boats seek to establish their own path, Pilgrim breaks away and the competition disappears, leaving unimpeded views of the city. As designated members of the crew jump around at Paul's direction, adjusting sheets, tightening winches and ducking to miss the boom, the rest of us climb back and forth while the boat lurches 45 degrees to the side. This is the optimum sailing angle, which means a great deal of any race is spent with legs dangling over the edge on a yacht that looks perilously close to capsizing. Nevertheless, as beautiful as twilight sailing is, it's easy to recognise that this is only a ripple on the surface of Pilgrim's potential. Paul calls it ''a thoroughbred that we're keeping in a small paddock''. While the ''paddock'' of the harbour is enough for most riders, Paul's eyes light up at the suggestion of jumping the fence and bolting. Pilgrim has circumnavigated Australia and raced several times in the Phuket King's Cup Regatta under a previous owner. Paul and Clare plan visits to New Zealand, Samoa, Papua New Guinea, Hawaii and the west coast of the US. ''How long is a piece of string?'' Paul says as he contemplates the possibilities. As a yacht master with Master 5 qualifications, Paul also uses Pilgrim to train people seeking to develop skills with a view to long-term sailing on their own. A weekend to Pittwater is available for sailors with more modest ambitions. For the rest of us, a leisurely turn past Camp Cove is enough of a thrill, glimpsing the ocean as Paul describes the Sydney to Hobart yacht race. What was once a gentleman's competition is now an extraordinarily expensive exercise in endurance, ''total uncomfortable boredom interchanged with sheer terror for four days'', he says. After our own race, the sailing club headquarters in Rushcutters Bay is abuzz with clinking bottles as everybody waits for the results. Fairy lights are twisted around a palm tree; tables huddle against the shore. A noticeboard advertises for crew members beneath a chart of sailor's knots. Lance Richardson sailed courtesy of Pilgrim Sailing. Pilgrim Sailing takes part in Friday twilight races from October to March, leaving from Double Bay Marina. Price is $50 a person, which includes nibbles after the race. Sail training, weekends away, personalised tours and private functions are also available. Phone 0432 297 911, see pilgrimsailing.com.au. IF YOU'RE a beginner wanting to break into the sport, a good starting point is to register at Yachting Australia (partnered with the Australian Sports Commission). On its website are details of what's needed to get involved, ways to learn, local clubs and training centres and crews you might join after you've gained some experience. See yachting.org.au. There are a number of clubs and businesses in Sydney with introductory sailing courses. These include Pacific Sailing School (pacificsailingschool.com.au), while Flying Fish is a Royal Yachting Association sea school that conducts three-hour, weekend and five-day sailing courses in Sydney's Middle Harbour; see flyingfishonline.rtrk.com.au. Lake Macquarie Sailing Charters runs courses accredited by the Australian Yachting Federation, from beginners to offshore training; see lakemacquariesailingcharters.com.au. In northern NSW, Baysail Sailing School at Byron Bay runs a range of certificate training and sailing packages, from single-day introductions to 10-day intensive programs; see baysail.net.au. Along with Yachting Australia, a good place to find crews with advertised vacancies is the Royal Australian Naval Sailing Association. Its online noticeboard is full of upcoming expeditions for serious sailors. See ransa.yachting.org.au. Crewseekers is an international portal connecting prospective crew with yacht owners around the world. See crewseekers.net. 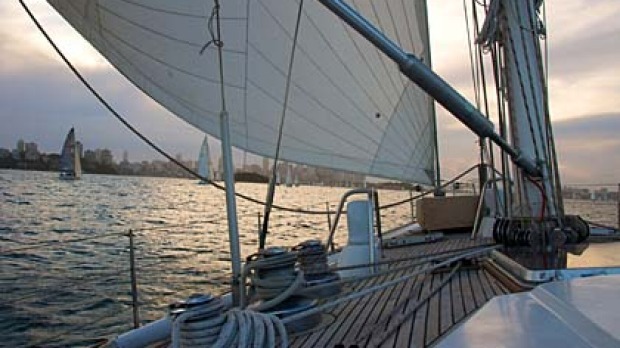 If a simple cruise on Sydney Harbour is more your style, Sydney By Sail has three-hour tours for $150 a person. Bookings required, see sydneybysail.com. A Harbour Hopper pass, which allows passengers to hop on and off at 10 of the harbour's attractions, is available until January 30. One- and two-day passes available; phone 9206 1111, see www.captaincook.com.au/harbourhopper.